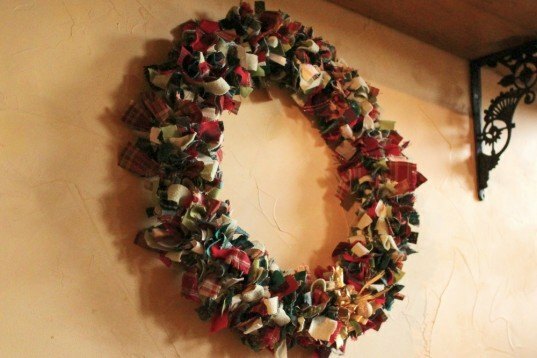 Make this eco-friendly, upcycled fabric wreath with our super easy step-by-step guide! Hanging wreaths date back to ancient civilizations, where they were used to coax the gods to return daylight during the harsh and dim winter solstice. Today, wreaths are similarly used to signal the start of the holiday season. 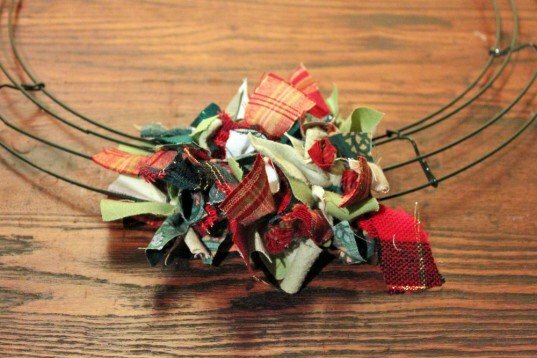 This year, instead of purchasing an evergreen wreath that will get tossed out in just a few weeks, you can upcycle old tablecloths, tea towels and other fabric remnants into a gorgeous, green and totally unique wreath. Read on to see how we created the beauty above, and then make your own! – Fabric shears. These will cut through fabric more easily than standard scissors. – A collection of small pieces of fabric swatches. We used table cloths, placemats, pillow cases and remnant fabrics found in the far depths of our closet, or at my local thrift store. I chose to use plaids, stripes, and other patterned fabric with dominant reds and greens. – An 18″ diameter wire wreath frame with four circular hoops. We found one for less than $3 at a local craft store. – Bits and bobs from used or broken holiday decorations. We had collected some bows, bells, and faux berry branches attached to gifts in years past that worked perfectly. 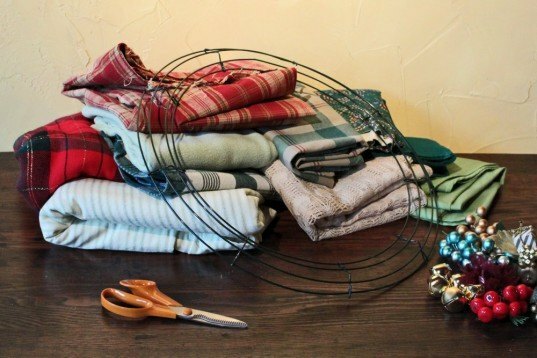 First, cut your fabric into roughly 1″x6″ strips and organize into piles by pattern. You don’t have to worry about being very accurate with the sizing. You may not need to cut all of the fabric you have collected, but make sure that you have several hundred strips to start with. Tie the strips with simple knots around the wired frame, alternating colors and patterns. Bunch the knotted strips close together and continue around the wire frame. 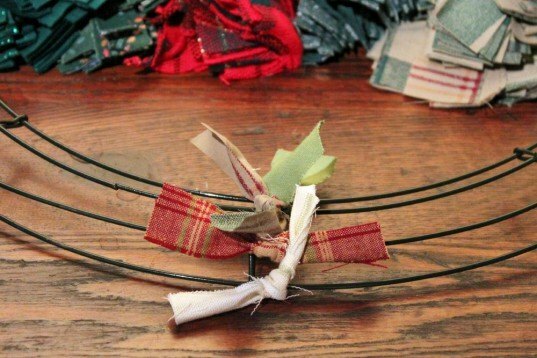 Once you have filled the entire frame with knotted fabric, select a decoration you like use as an accent for your wreath. We attached few round bells and bows with a needle and thread. You could also use hot glue or thin wire to attach your accents. STEP FIVE: Hang Your Wreath! Display your wreath on the wall by slipping a section of the frame’s wire right over a standard wall picture hanger. How many yards do you need of fabric? - Fabric shears. These will cut through fabric more easily than standard scissors. - A collection of small pieces of fabric swatches. We used table cloths, placemats, pillow cases and remnant fabrics found in the far depths of our closet, or at my local thrift store. I chose to use plaids, stripes, and other patterned fabric with dominant reds and greens. - An 18" diameter wire wreath frame with four circular hoops. We found one for less than $3 at a local craft store. - Bits and bobs from used or broken holiday decorations. We had collected some bows, bells, and faux berry branches attached to gifts in years past that worked perfectly. 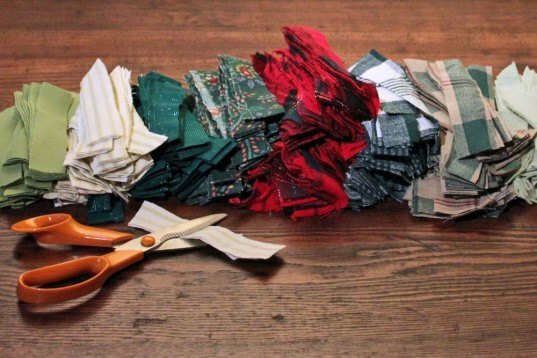 First, cut your fabric into roughly 1"x6" strips and organize into piles by pattern. You don't have to worry about being very accurate with the sizing. You may not need to cut all of the fabric you have collected, but make sure that you have several hundred strips to start with. 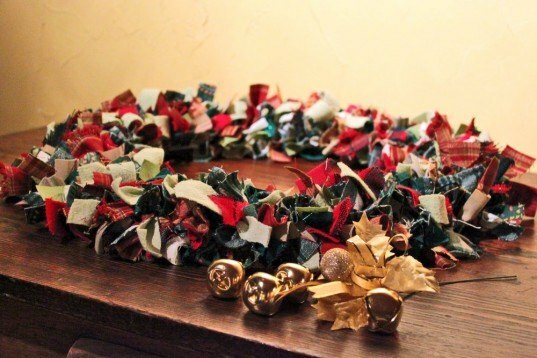 Once you have filled the entire frame with knotted fabric, select a decoration you like use as an accent for your wreath. Attach a few round bells and bows with a needle and thread. You could also use hot glue or thin wire to attach your accents. Display your wreath on the wall by slipping a section of the frame's wire right over a standard wall picture hanger.